Development of a rapid configuration system for textil production machinery based on the physical behaviour simulation of precision textile structures. The ModSimTex project is an European Commission Community Research 7th Framework Programme, Priority 4 NMP Project. The objective of the Project is to develop a system which will reduce dramatically the cost to develop new technical textile products by reducing the time, energy and raw material waste during the production machinery setup process. The textile industry faces important challenges regarding the production of new advanced textile products. It is not possible to define the characteristics and parameters of a given textile structure due to the difficulty of measuring them. This situation makes very difficult to configure the machines involved in the production of such textiles; the typical practices consists in manufacturing samples and through trial and error adjust the processing operations until the desired characteristics are achieved in the final product. With this procedure it’s very expensive to match the designer’s idea with the final product. The production setup takes a long amount of time and efforts and increases the cost of the final product. This is especially critical when a company is trying to develop new technical textiles. The vast majority of the existing systems capable to simulate textile products are limited to the visual representation, without any kind of mechanical or physical evaluation of the properties of the textile structures. Of course, these tools don’t take into account the configuration of the production machinery, so they aren’t capable of help in the setup of production machinery. 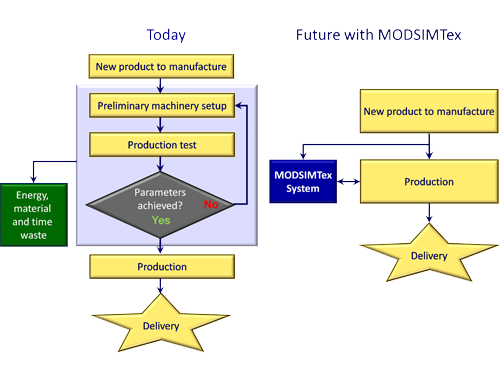 Unlike these conventional design systems, the core of this proposal is to develop a virtual simulation system of the physical-mechanical properties of the textile structures oriented to the fast setup of the machines involved in the whole textile chain manufacturing process (yarns, woven fabrics, knit fabrics, needle-punch non-woven, hydro-tangled non-woven, and composite structures). This virtual construction system will allow the prediction of the multifunctional textile performance before the actual textile is manufactured allowing the settings of the production machines to be either an input or an output of the computation thus reducing dramatically the effort and cost to produce small batches or develop a new advanced technological textile.